Just like some humans, our pets may have special nutritional needs – anything from calorie control for less active or obesity-prone individuals to a special gastric diet for inflamed intestinal tracts. Our veterinarians and RVTs are very knowledgeable about nutrition for all types of dogs and cats through every stage of their lives to help you choose the right food for your pet. In fact, poor nutrition can be the root cause of many serious animal health issues including obesity, diabetes, cardiovascular conditions and overall reduced life expectancy. For example, studies have shown that obesity reduces life expectancy by up to 20%. Just like some humans, our pets may have special nutritional needs – anything from calorie control for less active or obesity-prone individuals to a special gastric diet for inflamed intestinal tracts. 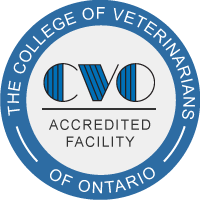 Our veterinarians and RVTs are very knowledgeable about nutrition for all types of dogs and cats through every stage of their lives. In fact, poor nutrition can be the root cause of many serious animal health issues including obesity, diabetes, cardiovascular conditions and overall reduced life expectancy. For example, studies have shown that obesity reduces life expectancy by up to 20%. If your pet is exhibiting any chronic symptoms (vomiting, diarrhea, weight gain/loss, dull coat, lack of energy), he/she may have a nutritionally-based problem. Many of today’s commercial pet foods contain additives such as dyes and preservatives, or may have an unbalanced nutrition profile. Discuss your pet’s diet and symptoms with us, and we will, after appropriate diagnostics, recommend the best possible diet for your dog or cat. BMVS carries the entire line of Medi-Cal® Royal Canin® Veterinary Diet foods, which are developed by nutritional specialist veterinarians, in Guelph Ontario. MediCal Royal Canin offers a wide range of products, developed to help with all types of issues from dental health to calorie control, gastric sensitivity and allergies to joint inflammation.